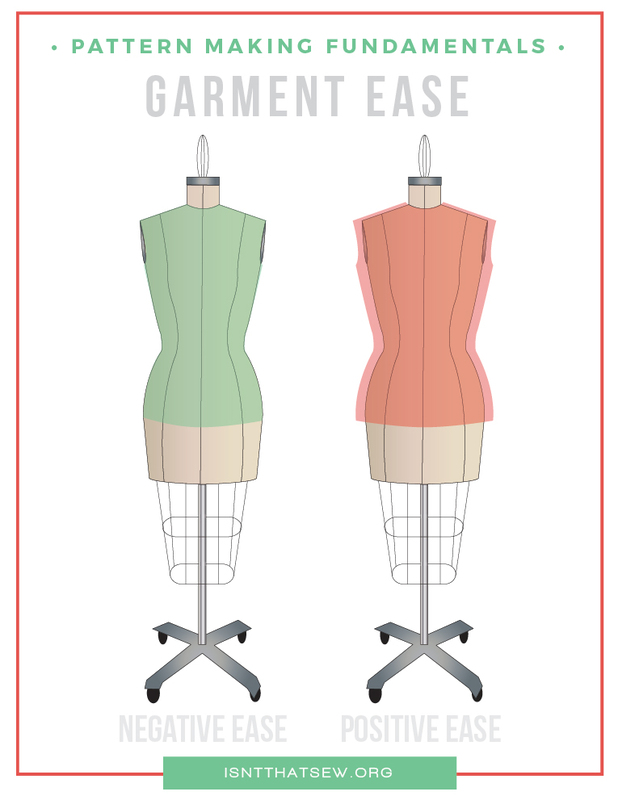 Ease is the amount of extra fabric that is built into a sewing pattern to allow the garment to fit in a relaxed position. A woven pattern would have a positive amount, where a knit pattern could have either a negative or positive amount. Let’s take a closer look. With woven fabrics, the garment needs to be at least somewhat larger than the body; otherwise we would not be able to move in our clothing, right!? This difference is referred to as wearing ease. Essentially, it is the minimum amount of room added to a garment so that the garment feels comfortable and provides ease of movement for normal body movement. Basically, it is the number of inches added in addition to the actual bodies measurements. Again, this can be thought of as comfort room. We all have a certain way we like our clothes to fit and it’s not exactly the same person to person. With that said, the commercial pattern industry generally states that wearing ease is recommended to be 2 1/2″ (6.4cm) at the bust area, 1″ (2.5cm) at the waist and 3″ (7.6cm) at the hip area. Design ease is any extra space that is purposely added to a garment by the designer to achieve a certain look, or drape. How much or how little is added will determine the silhouette of a garment; whether it will be close-fitting, fitted, semi-fitted, loose-fitting or very loose-fitting and is often added in addition to wearing ease. With knit fabrics, the garment’s finished measurement is often equal the wearer’s body measurements, but, this is not always the case. The knit fabrics structure, stability, and its percentage of stretch will provide a guideline for the ideal amount to add or not to add. Some fashion knit tops on the market today purposely have an excess of positive ease to create an attractive drape, movement, and comfort. Read more about knit fabrics and learn the one thing you need to know about knit fabrics. Garments made out of very stretchy fabrics, such as spandex leotards, may actually be made smaller than the body. Negative ease is often found in garments such as active wear and swimsuits. That’s because the fit is partially obtained as the fabric stretches around the body. Positive ease, as stated above, can be used for both knit and woven fabrics. However, it is a required in woven fabrics to achieve ease of movement. Bust area – Add 2 to 4 inches to the bust measurement. The larger the bust and body size the more ease to factor in. Waist area – Add ½ to 1 ½ inches to allow for turning around, bending and raising arms. Hip area – Add 2 to 4 inches, again, the larger the body size or give of the fabric, the more ease to consider. 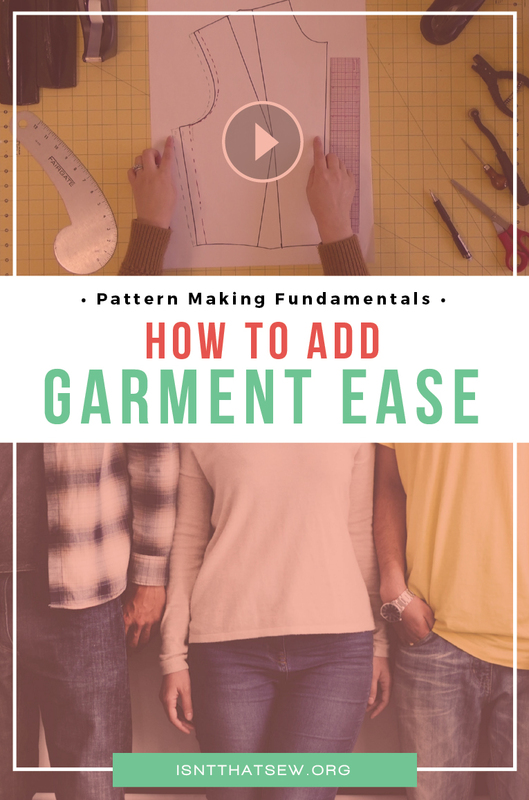 I have been patternmaking for a few years now and I understand ease when it comes to wovens and knits. However, what about stretch wovens? I have some stretch denims and stretch cottons I would like to use for pants. How would I figure in ease for that? I know it is based on the woven sloper and not my knit one, but I don’t know if it is still negative ease in places? Thank you. 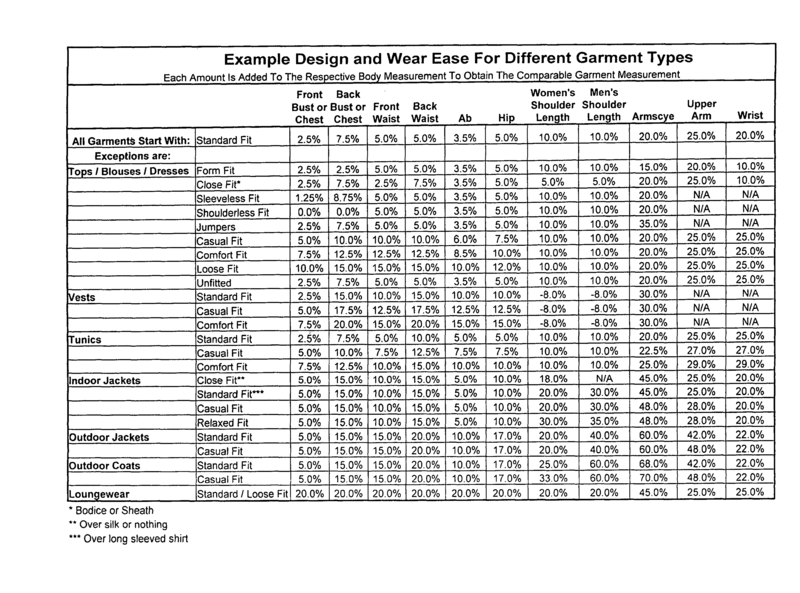 Above you mention the recommended wearing ease in the commercial pattern industry, are these generally interchangeable between positive wearing ease with wovens and negative wearing easy with knits? 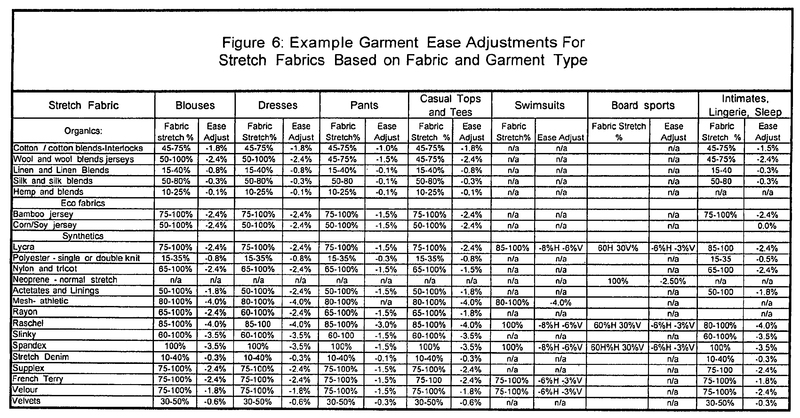 If so, for negative wearing ease how much would the recommended figures be adapted depending on the percentage of stretch of the fabric? Totally understand that it’s dependent on what you want the style/fit to be but I’m unsure what to use as an initial starting point. Thanks so much, this will certainly be a good starting point! Hi, I’m new to sewing and I’m having problems understanding what the negative ease is on knit patterns. Every time I follow my body measurements on a pattern, it turns out huge on me. I’m using the correct fabric recommendations and they still turn out too big. I’ve searched every where for an explanation and can’t find anything. Would you be able to make a blog post or a video talking about this. I would be forever grateful!! Hi Martha – So, negative ease in knits. It can be confusing – no worries…I totally understand. Basically, if you want the garment to be tight (meaning it stretches to fit – like a sports bra or leggings) then you would use negative ease. If you want it to have a lot of drape – like a loose fitting knit top – then you would use positive ease. ALL woven fabrics use positive ease. But, with knits it is more of a preference based on desired fit, style, and design. It would help me if I knew what kind of garment you are making…Let me know so I can better assist you! Do you know much about ease for children’s blocks? I’m currently drafting a Winifred Aldrich body block for a 2 year old and struggling. I’ve made it, the chest measurement is 57cm but the block comes out at 66cm! She says that the width of the block is 1/4 chest and then to add 3cm – this equates to 12cm ease! Do you think it might instead intend you to add 3cm to the chest measurement before dividing by 4 to find a quarter? This would equate to a total of 3cm ease in the chest. I’ve heard that the Aldrich books add to much ease for children. What kind of fabric are you using? A woven? If so, maybe reduce it by half? Simply and well-said. Needed brushing up. For a skirt, would suggest 10in-40cm hip ease for no stretch. Thank you. I think that is probably too much. I’d say anywhere from 2-6 inches, depending on preference would be ideal for a pencil skirt.